are you looking for a place to recharge with some healthy food after dining out on all the rich and decadent vegan cuisine that los angeles has to offer? well then look no further than a votre sante in brentwood. the cozy eatery offers light and simple natural cuisine that’s healthy yet extremely delicious. we hit up a votre sante recently with none other than the healthy vegans, who turned us on to the place, and had a 3 course dinner that left us feeling energized and satisfied rather than stuffed and bloated. for my main course i ordered the dragontail from a votre sante’s vegan menu. although the restaurant has a separate vegan menu, don’t be fooled—most of their other offerings are vegan as well. for instance, they have a health mex menu on which almost everything is vegan. anyways, the dragontail was a winner. the bowl of food was absolutely massive and filled with vegetables, tofu, rice and black beans…all covered in tamari, tahini and hijiki. man, this thing was incredible. so fresh and simple yet packed with flavor. i don’t know how i managed to eat it all, but i did! the rice was some of the fluffiest i’ve ever tried, and the tofu was soft and juicy. i couldn’t get enough of the sauce either—at the end of the meal, i was practically licking the bowl. 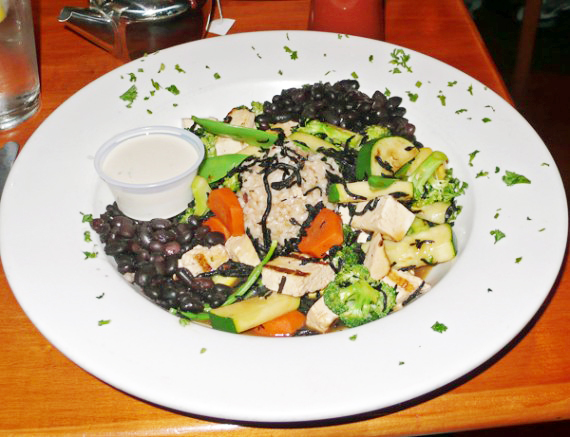 mr. meaner also dined off the vegan menu, and ordered the blackened tofu feast with steamed vegetables and brown rice. this perhaps wasn’t the best angle to take the picture from, because you can’t really see the huge mound of marinated and blackened tofu! oh well, at least you can see that a votre sante didn’t skimp on the vegetables. i tasted a bit of the tofu and it was awesome…however, i still preferred my dragontail. this is definitely a super healthy option though, as you can see the plate is 80% vegetables, paired with extremely high quality rice and tofu. our dining partners lex and kristin ordered some salad and pasta dishes, both of which looked delicious. they also ordered their entrees oil-free, and a votre sante was happy to accommodate…good to know, if you are in the mood to eat something uber-healthy. but lemme back up a bit, i forgot to tell you about the soup! 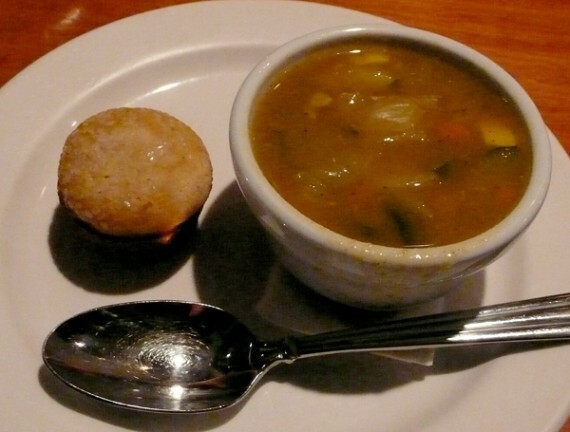 everyday, a votre sante offers two vegan soup options, served with a vegan corn muffin. we got cups of soup around the table; mine being the corn chowder (pictured above) and mr. meaner’s the vegetable (below). 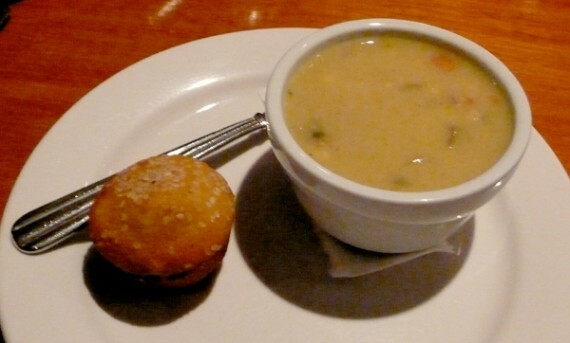 both soups were extremely tasty and hit the spot—i really can’t fault them. the perect warm, comforting starter on a blustery autumn night. even after all that food, we still saved room for a bit of dessert. 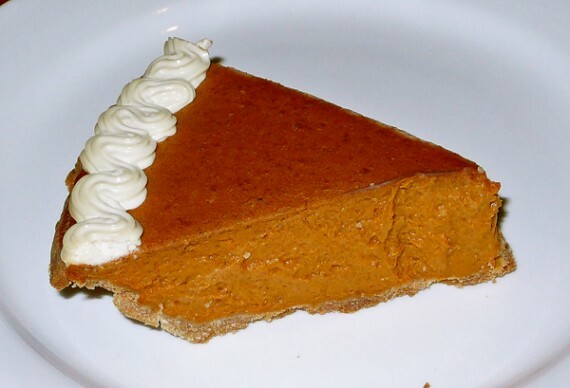 we got the pumpkin pie (we are less than a week away from halloween, after all!) and it was awesome. it was thick, moist and oozing with sweet pumpkin and cinnamon flavor. it definitely tasted “healthy,” but not in a bad way…just in a way that made me feel really good about eating it. the crust was thick and chewy, and it was even topped with a swirl of vegan whipped cream. total yumz! i can’t believe it has taken me so long to eat at a votre sante, and i would highly reccommend it for a refreshingly light and tasty meal. 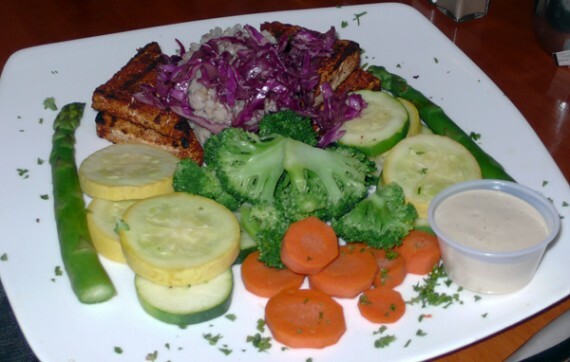 the vegan options are plentiful, they use high quality ingredients, the service is polite, and the atmosphere is relaxing. i am thinking i will be back very soon for a healthy lunch prior to a stroll on the beach. we definitely need more places like this in LA!